A mechanical engineering faculty member recently received certification as a trainer in additive manufacturing. 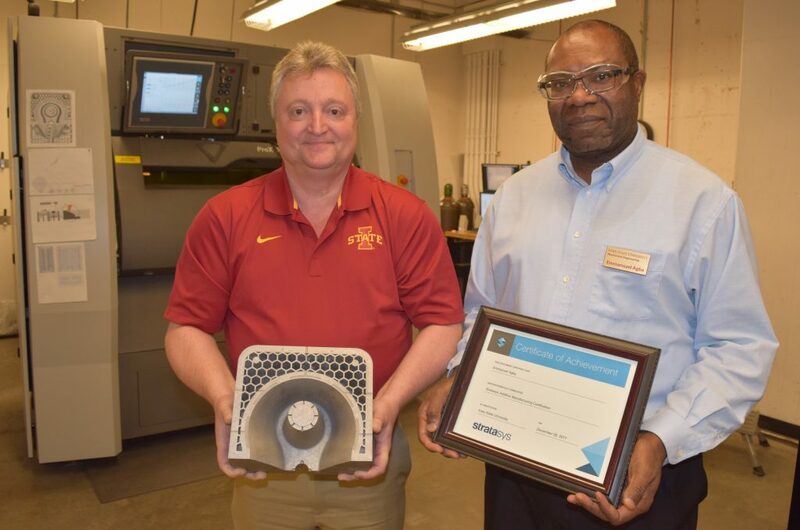 ME senior lecturer Emmanuel Agba completed a certification program offered by Stratasys, a Minnesota-based manufacturer of 3D printers and 3D production systems. The certification program is part of Stratasys’s effort to enhance workforce development and bridge the industry skill gap in 3D printing operations. The development of the certification program is being supported by several educational institutions, including Iowa State through the Center of Industrial Research and Service (CIRAS). This is in response to an increased demand for skills in 3D printing (also known as additive manufacturing) within industry. The certification indicates Agba’s understanding of the basics of 3D printing technology, software, design, materials, applications, and benefits. The material was presented as a 40-hour online course that concluded with a two-hour exam. The first class – which included two faculty members, four students, and two P&S staff members – was taught by Chris Hill, CIRAS’ Technology Assistance Program (TAP) Director. CIRAS and the ME department started Iowa State’s metal 3D powder bed printing collaboration in 2015. The program since has produced millions of dollars in economic impact involving Iowa’s manufacturers. Agba said 3D printing has existed since the 1970s but has evolved rapidly because of the digital revolution over the past couple of decades. This revolution was characterized by the widespread adoption of digital computers for 3D modeling and visualization, coupled with the extensive use and interconnectedness of networked devices. In addition to being used for direct manufacturing, 3D-printed parts can also be used as aides for production processes. For example, 3D-printed mold inserts and make guides can be created to assist with drilling and cutting. 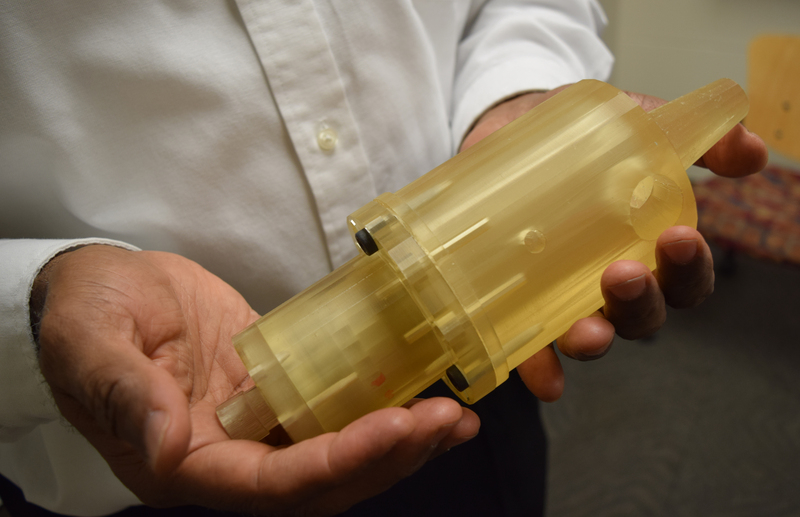 ME senior lecturer Emmanuel Agba holds a 3D printed model of his high speed spindle design concept inside of his office on January 22, 2018. “My first interaction with additive manufacturing was in the early nineties at NASA’s Marshall Space Flight Center where I used a Liquid Vat photopolymerisation – or VAT – to make a model of my high speed spindle design concept. That model is still in my office today,” Agba said. Agba said the content covered in the certification program can be applied to ME courses like Engineering Graphics and Introductory Design (ME 170), Introduction to Mechanical Engineering Design (ME 270), and Mechanical Systems Design (ME 415). In addition to being covered in the curriculum, additive manufacturing has been used by various student groups on campus. PrISUm solar car, for instance, 3D printed more than 50 parts on their latest model Penumbra which they took to Australia and raced across the outback for the 2017 Bridgestone World Solar Challenge. Agba serves as a faculty adviser for PrISUm as well as for Iowa State’s 3D Printing and Design club which was started in 2015. Hill worked with Stratasys to develop the material for this first of three planned certifications. Through CIRAS, Hill works to educate Iowa industry and complete company-specific projects that promote the adoption of technologies, including 3D printing. He also provides quarterly industry tours of the metal printer, which is located in the basement of Sukup Hall. Hill, who has over 25 years of 3D printing experience, says the certification is a step towards providing industry with systematic training materials to ensure a foundational understanding of various 3D printing technologies and how they could be applied to create value. “The program not only provides information on the various systems, but it also does a good job of covering the available materials and applications. This focus will continue to be expanded in future certification material,” Hill said. 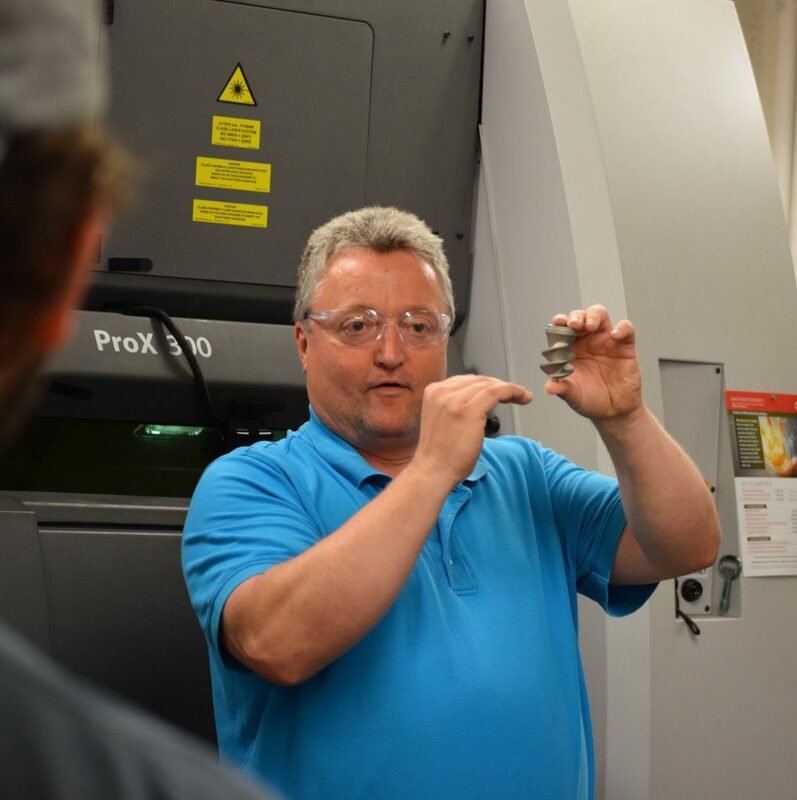 Chris Hill, Technology Assistance Program (TAP) Director for Iowa State’s Center of Industrial Research and Service (CIRAS), explains a 3D-printed part to students in the summer 2017 section of ME 324L. Behind Hill is a 3D printer located in the basement of Sukup Hall. Echoing Agba, Hill said described an increased focus on 3D printing and additive manufacturing by a wide variety of industries across the globe. This in turn, he said, is driving interest through the educational system from elementary schools to universities. Lowering equipment and material costs along with increased capabilities will continue to drive interest in 3D printing. This global interest was demonstrated through this program, as Stratasys’ had the support of higher educational institutions from across the US and Europe. Earlier this semester the ME department opened its Additive Manufacturing Lab in Black Engineering Building. The lab will offer its additive manufacturing services to other departments on campus and to Iowa industry through CIRAS. Student workers also will learn firsthand how to operate 3D printers and other relevant equipment. Agba hopes that eventually the ME department will be able to offer a course fully devoted to additive manufacturing.